dineLAâ€™s Acura Tour of the City from Evan Romoff on Vimeo. Last month, I was asked by Dine LA, a non-profit subsidiary of the Los Angeles Convention and Visitors Bureau and coordinator of LA Restaurant Week, to shoot a little video on featuring a few restaurants around town. Honored by the consideration, I accepted, and had quite a fun time being driven around in a brand-new Acura TSX Wagon (with Acura being sponsor of the project). You can see the video above, or embedded into the video section of the Dine LA website, or even Evan’s vimeo page, which has the big version. Hope you enjoy!! And have a great weekend. I decided to take the opportunity this week to play hooky from work to pose like a Weezer fan and participate in the video shoot of Troublemaker. And I’ll be honest here: I like the band but I haven’t really loved ’em. I guess the disadvantage bands might have with me is that when they achieve instant commercial success from the debut album, I’m never given the chance to get intimate with their music privately. My possessive self has to deal with sharing the music with everyone and their mother – including people who wouldn’t ordinarily be scoping out the “good” music from the mediocre. 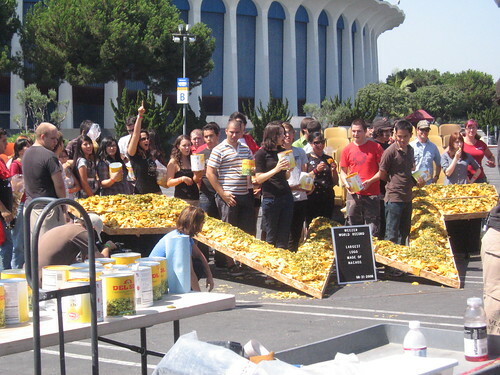 This =W= holds the world record for the largest logo made of nachos. Then again, I think about it and realize that sometimes that’s the ungrateful L.A. scenester in me. Because that’s only been true since I’ve become local to this area. “So many things to do, so many bands to see,” as they say. So while you could also argue that the music scene is a little bit diluted in L.A., there’s always a silver lining when you come to events like these and get the chance to observe the diehard fans in all their glory. I noticed fans drove all the way from Sacramento to be a part of this shoot, even Las Vegas. And we only got the confirmation email the day before.